The landscape of Coniston Water, the River Crake, the becks, tarns and surrounding fells and woodlands are all integral to the heritage of the area, and have made it internationally recognisable. The landscape has long been the inspiration for artists, authors and poets. It has also been fundamental to the growth of historic local industry, through slate and copper mining and charcoal burning, and the culture and communities that grew up around them. To this day the landscape is still the foundation of economic and recreational activity in the area. The Coniston and Crake catchment area also has great ecological value. It is home to indigenous Biodiversity Action Plan priority species, such as Arctic charr, Atlantic salmon and sea/brown trout. The area is also home to Sites of Special Scientific Interest, Special Areas of Conservation and County Wildlife Sites, and the Crake leads into the Leven Estuary and Morecambe Bay RAMSAR site. However, the catchment is at risk. Over the last few years there has been a decline in fish numbers, especially Atlantic salmon and sea trout populations. This is due to a variety of reasons – siltation and over-enrichment causing the loss of spawning gravels, poor egg and juvenile survival rates through deoxygenated gravels and a lack of safe river margin habitats, and historic modification and canalisation reducing flows and turbulence required to clean spawning beds. Water quality has declined due to the input of phosphate and other nutrients, leading to eutrophication (excessive weed growth and algal blooms), and there has been a decline in ancient reedbeds, and incursion of invasive species such as New Zealand pygmy weed and American skunk cabbage. This project was put together to address these issues, and to prevent them from getting any worse. With help from the local community (and the Heritage Lottery Fund!) 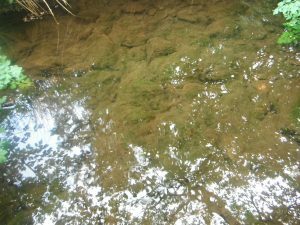 we hope that it will be possible to reverse these impacts on our freshwaters. 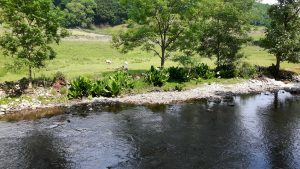 Coniston and Crake Catchment Partnership applied for a Heritage Grant from the Heritage Lottery Fund (HLF) for Conserving Coniston & Crake in 2015. They were successful in passing the first round and awarded development funding of £102,100 to develop the project further. In November 2016, a second round application was submitted for the full 3 year Heritage Grant of almost £1 million. The application was again successful so the Conserving Coniston & Crake project began in 2017 and will come to an end in 2020.